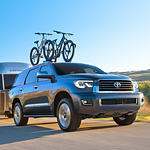 Toyota continues to make vehicles that consumers want, whether it’s cars, trucks or the very popular full-size SUV known as the Toyota Sequoia. The new Toyota Sequoia is loaded with some of the latest technology features. Come to Hixson Toyota and speak to our highly-qualified staff about the many features available in the Sequoia. From the Entune™ Premium Stereo and integrated navigation system to its USB and Bluetooth® connectivity, the Sequoia has almost every possible technology at your fingertips. Whether you’re listening to tunes, navigating a map or making a call with your device, technology is never far from the Sequoia. The moment you put the SUV into reverse, the integrated backup camera shows you everything behind you for your safety. If you’re still not convinced the Toyota Sequoia is all that and more, visit our Toyota showroom and take one out for a test drive. You’ll love everything about the Sequoia.